2016 is off to a good start – I am in a magazine! 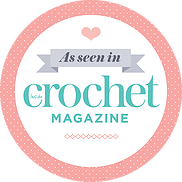 At the end of last year I was interviewed by the UK magazine Inside Crochet for an amigurumi article in their magazine, and the issue has recently been published. In the article you can find tips from me on making amigurumi, as well as from other fellow ami designers. It was so fun being involved in this, especially since I am among other designers I admire and love. Bill the Pineapple was also featured in the article as a fun amigurumi pattern to try – he looks great in print! Pick up your own copy of the magazine this month to read the article and learn more. There are also some cute ami patterns in the issue – the duckling is especially adorable! Don’t forget to sign up for my amigurumi newsletter to receive emails filled with ami fun. You can also follow me on facebook, twitter, instagram, and pinterest to keep up to date on all things hookabee.